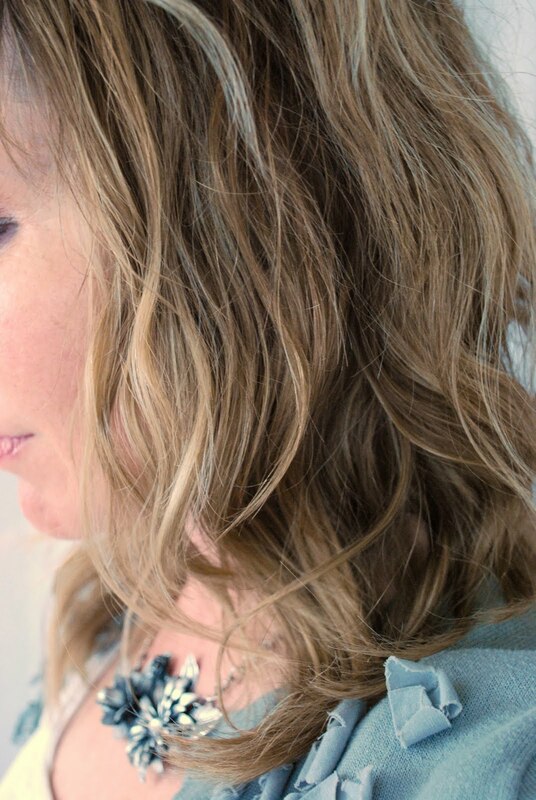 Ever since I decided to grow out my hair, I have been on the lookout for the perfect way to create pretty soft curls or waves. And that's not as easy as it sounds. You see, I have a lot of hair, but it is VERY fine. It has a hard time holding curls. I thought I'd found the perfect way to create beachy waves. I even posted about it here. But I was never completely sold on the way it looked. 1. Wash your hair, then let it dry almost completely....leaving just a bit of dampness. Alternately, you can spray down your dry hair with a bit of water. 3. Once you've secured the buns, blow dry the hair for a couple of minutes on hot to set the curls. Then you can do one of two things...after letting your hair cool for about 20 minutes, you can remove the buns, and you'll have soft waves. Or you can do as I do and sleep with the buns in your hair (it's not uncomfortable, I promise.) 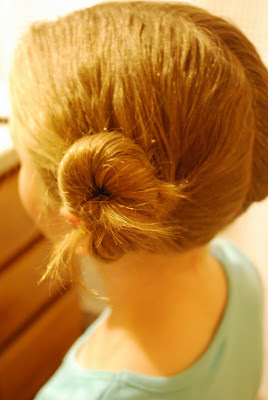 Then in the morning, remove the buns and run your fingers through your hair to separate the strands. Add a little spray at the roots for volume and you're done! It's seriously that easy...and the curl lasts ALL DAY!!! Okay, so you may have noticed that the old blog seems to be overrun with giveaways lately. I have been a bit worried about that. It just so happens that I have had a lot of sponsors and product reviews pop up at the same time. And I love to host giveaways for my sponsors. And I enjoy doing product reviews. So I've been more than happy to have all these giveaways. Just worried that my readers might think that's the only thing I'm focusing on. So I want you to know, my lovely readers...that my blog is not turning into one of those crazy host-a-giveaway-daily type blogs. My main focus is still DIY and decor, with a little bit of entertaining and style thrown in for good measure. I have a lot of projects in the works to share with you along those lines...but I'm still getting back into the groove after taking last week off for spring break. So please bear with me. You guys are the best!! Mwah!!! Frugal Friday goes live tonight at 8:00 pm with a double-size edition of my Frugal Round-up! Awesome and unexpected idea! I will be trying this. :) Thank you. Ok or try this for waves - when your hair is still soaking wet hit it with hair spray and let it dry naturally. That's what I do. I'm definitely trying this...my hair is pin straight and will not hold a curl (except with hot rollers...those are awesome)...somedays I just want a wave...thanks so much for sharing your secret!!! My daughter will have to try this. She always wants curl. She has pin straight hair. I do not. I have no idea how to get the curls (like from a braid) to hold. It's hard to get back in the groove after being away for over a week too, just wanted to say that I'm glad your keeping it real about your blog:) Loved the imformation about the beachy hair, mine does this naturally so I straighten it with an iron, I'll have to try it though maybe it would tame it more. I use BACK TO THE BEACH by Brocato it's a texturizing mist that I bought from my hairdresser. i should also mention those beach wave sprays work well for wavy hair. there are inexpensive brands out there in addition to salon brands. just spray on damp hair and scrunch or twirl. the sprays are like salty beach water. your hair buns are cuter though! I think I will try this!! You've got a great layered haircut too! That plays a role. Can't wait to try this...especially since I am growing my hair out, too! This is perfect for those summer nights when I don't want to spend much time drying my hair! Thanks. ...and, if you forget to take the buns out before running to the store. You still look like a cute princess Leah from Star Wars. I love your hair like that! Thanks for the tip. My curls have been a bit droopy lately, so I may have to try this. I have the same problem with my hair, so I tried this method today and LOVE IT! I can't believe how easy it was. It took no time, and my hair looks like I spent hours curling it. Thanks for the suggestion! I like most everything you post. It makes me energized (not good after rc surgery and out of commission for 12 weeks), it makes me motivated, smile, giggle and want to win too!!!! You are doing a great job!!!! Instead I have to do this to make me look like I have some curl/body to my mass of hair. Thanks for having such a lovely blog!! I too have super thin hair (and unfortunately not a lot of it, like you do) and I figured out your trick several years ago and love it too! definitely the easiest and quickest! I've found through trial and error that its perfect (for my hair) when I do about 5 different buns, rather than 2. Then you get more waves at the roots. Just a tip! Great designging! I'm hosting a "Party in Paris" on my blog Friday. I hope you will stop over and say hi! I have fine hair too and use my straightners to create waves or curls - they last all day and only take me 5 minutes! 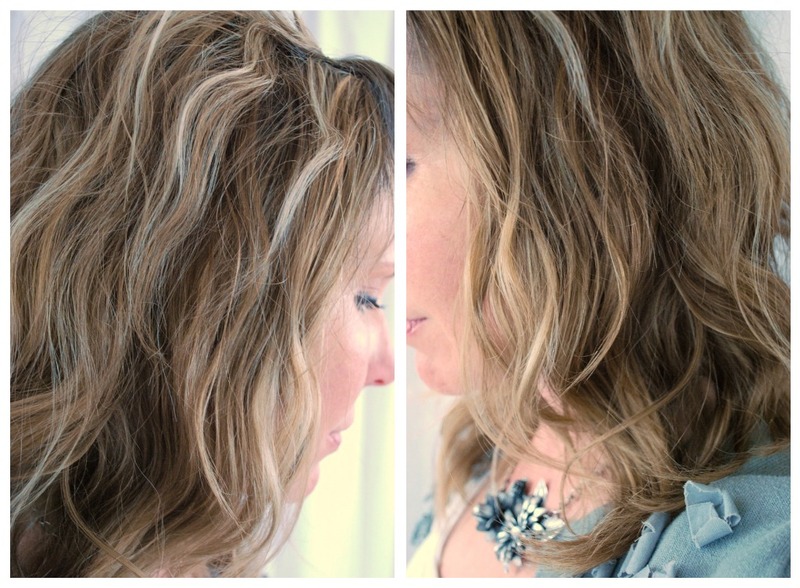 Some great ideas, I love the soft waves! I actually do this allll the time! I didn't before I had kids.... but now it seems I only get to shower at night and I am too tired to a) dry my hair and b) wait for it to dry. SO wet hair goes in bun and wakes up wavy. talk about a easy hair day!